Summers are short in Oregon. Short but sweet, as when it engages it stays locked in gear for its duration. One is safe to say that once July arrives we can plan outdoor activities without worrying about rain gear until September arrives. So here I am, taking advantage of the summer and of the July 4th holiday, going for another ride. What’s new this time? I re-set the windscreen on the BMW and added a small cargo box to it. The windscreen still needs some revision as I was getting strong buffeting still. 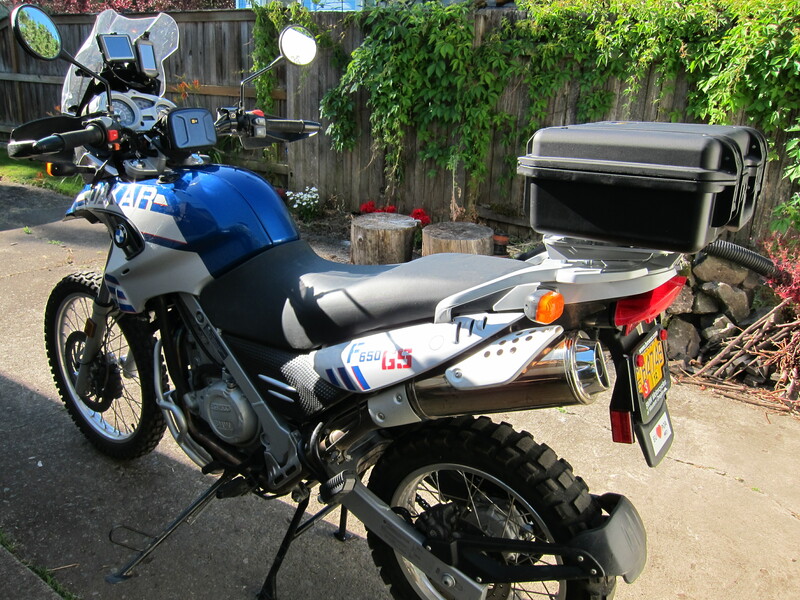 I tested it on a gravel road and it did not do so well there either, vibrating a lot. The cargo box, a Pelican box, worked well. For a test, I had it loaded with heavy tools. I set off for the same route as I had done last time I went to the beach. 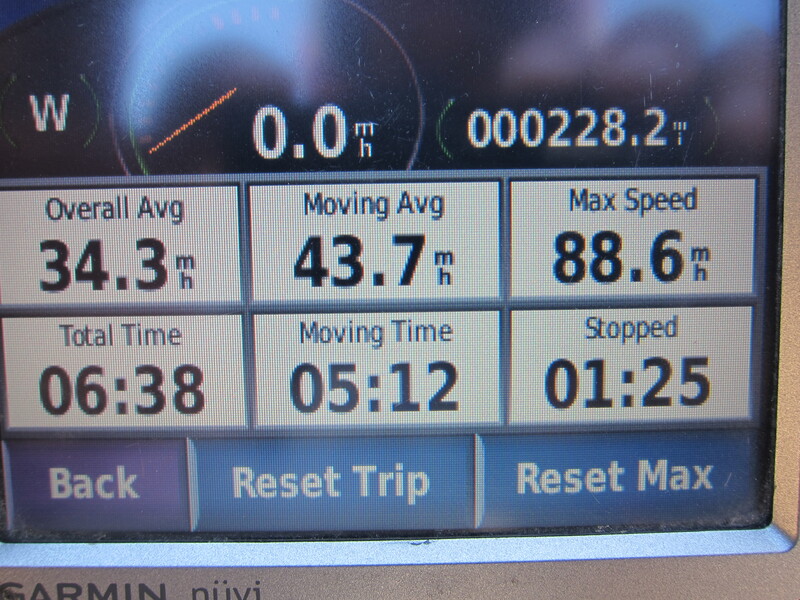 Filling the tank in Junction City confirmed my previous estimates: 61 mpg. Amazing little bike. I was looking forward to following my tracks from the last ride. 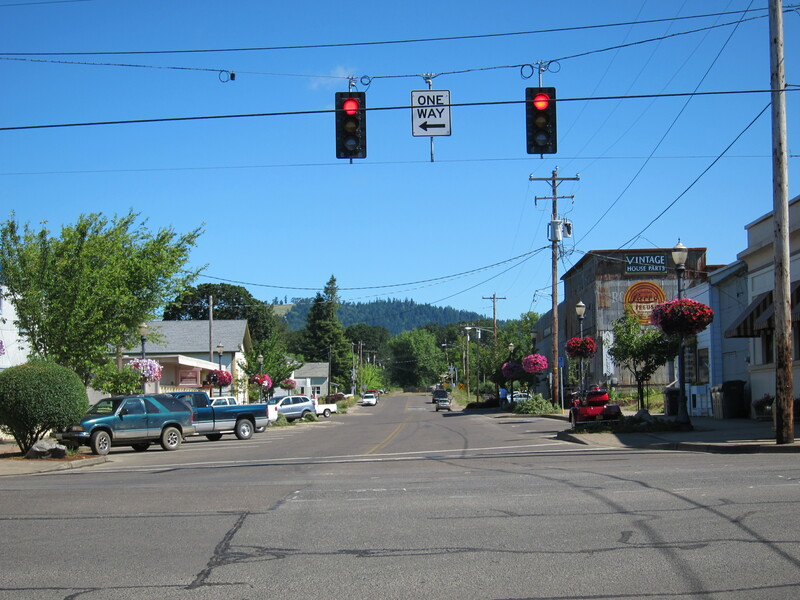 This time around going past the small towns along the way had a July 4th flavor. 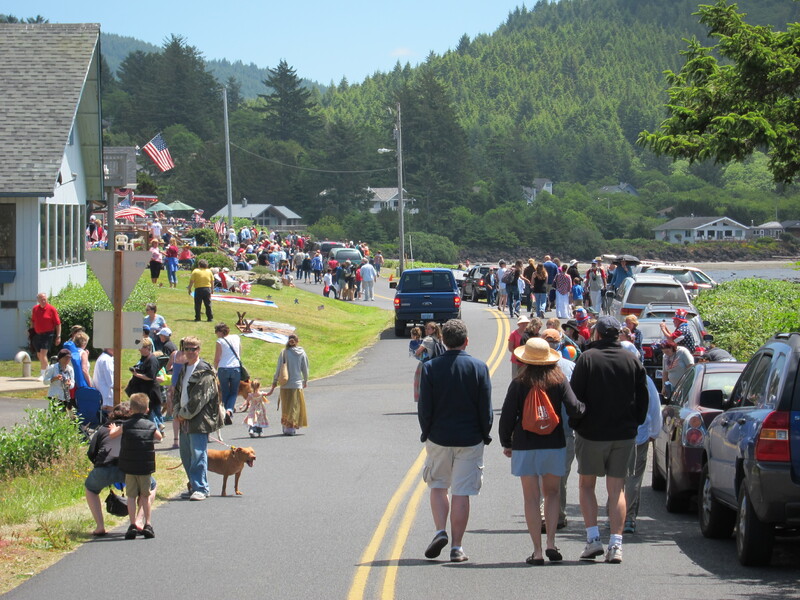 I was wondering whether I would run into a July 4th parade in one of these towns. Nothing in Monroe, as I went north on 99. Last time I rode past here (photo below) I wanted to stop and take a picture but I was running late for the Cycle Parts cook out. This time I had time, so I stopped. 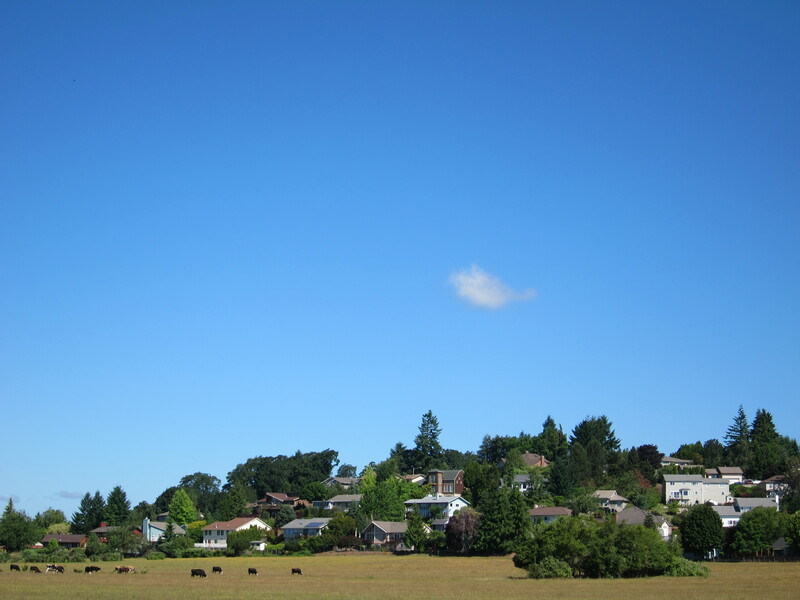 It’s just conglomerate of houses, a hill facing south, and the cows on the pasture. There is something I like about it. Perhaps because it could be considered a suburban, American version of Morano, in Italy’s Calabria, all houses facing south on a hill. Or a reminder that in my home town in Brazil, when my family moved from downtown Porto Alegre to a suburb in the same town, on a hill, we could hear the cow bells on a dairy farm down the hill from our house. That dairy farm has long been transformed into a jungle of condominiums and that suburb has become part of the city. I doubt this will ever happen here in this part of the Willamette valley. 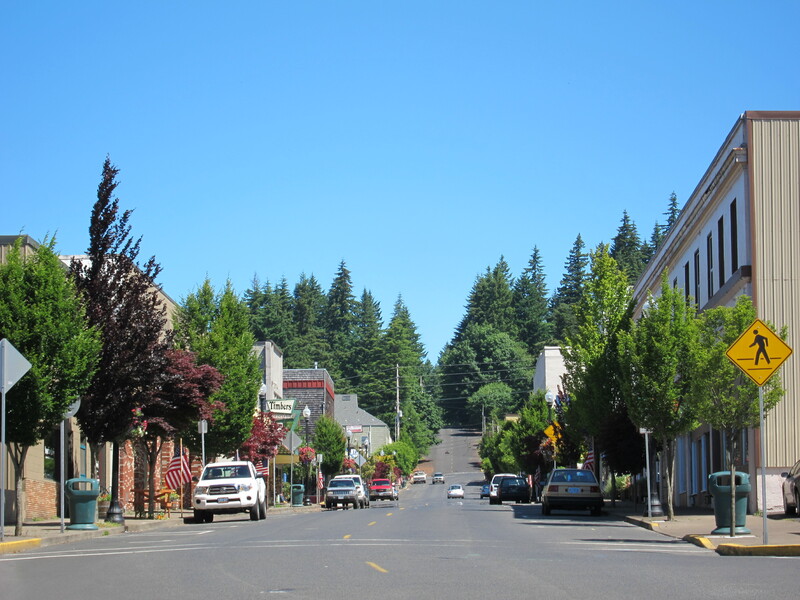 Downtown Philomath. No signs of parades. I made a left here, going west towards the Pacific. 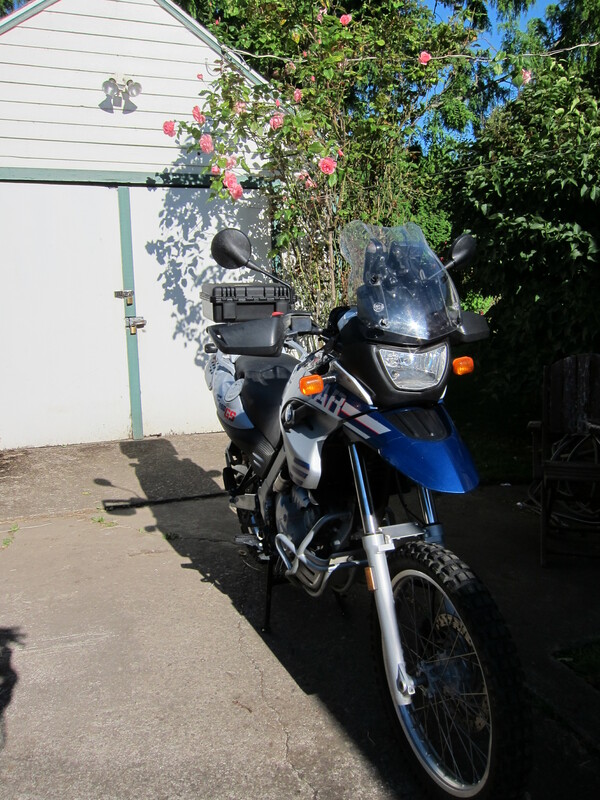 Several miles down the road and I detoured to check things in Toledo, OR. Here is a photo of downtown Toledo: no signs of parades here it either. So let’s check the Pacific. 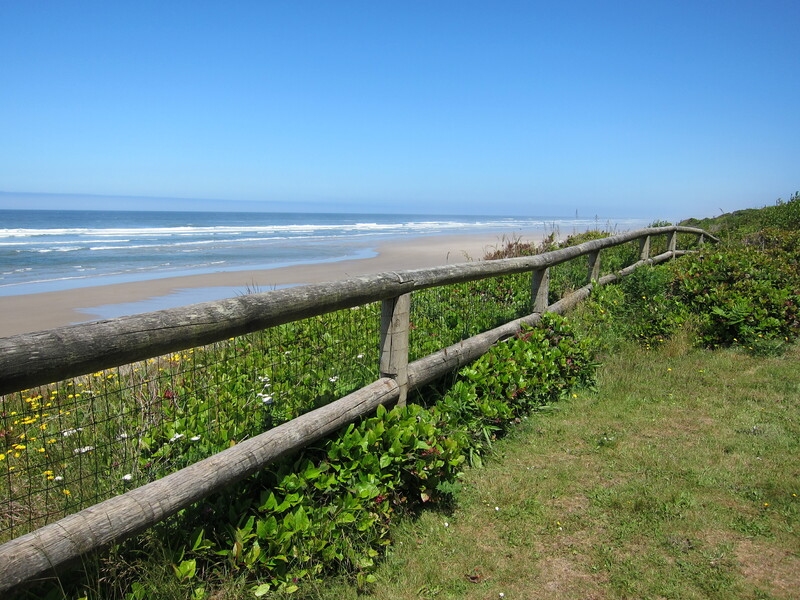 When traveling to the ocean, whatever ocean that would be, throughout my life, since I was little and in all the “betweens,” and still now, I’m always looking ahead in anticipation for the first view of the Ocean. 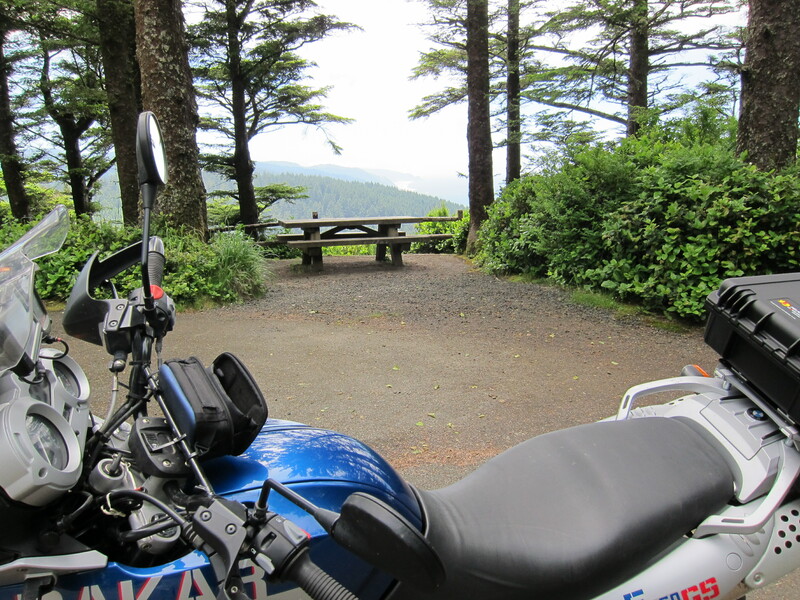 When traveling on US20, you come down the coastal range and you see the ocean from a couple of miles away. There was too much traffic for me to stop this time. Maybe next time. 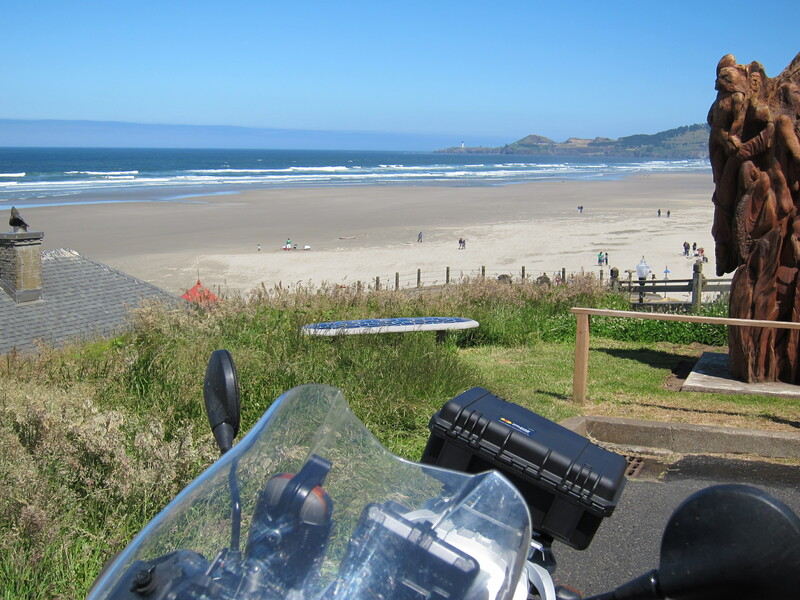 So I rode the bike to Nye beach for this photograph. In front of the Newport Visual Arts Center. While Eugene was getting ready for a warm summer day, just 60 miles away at the ocean it was rather cold and windy. Wear a jacket type of cold! But very pleasant for my taste! You can see people dressed up for low temperatures at the beach. I mentioned on another post, most of these bridges were built in the 1930’s, in an art deco style. I crossed the bridge and continued south. 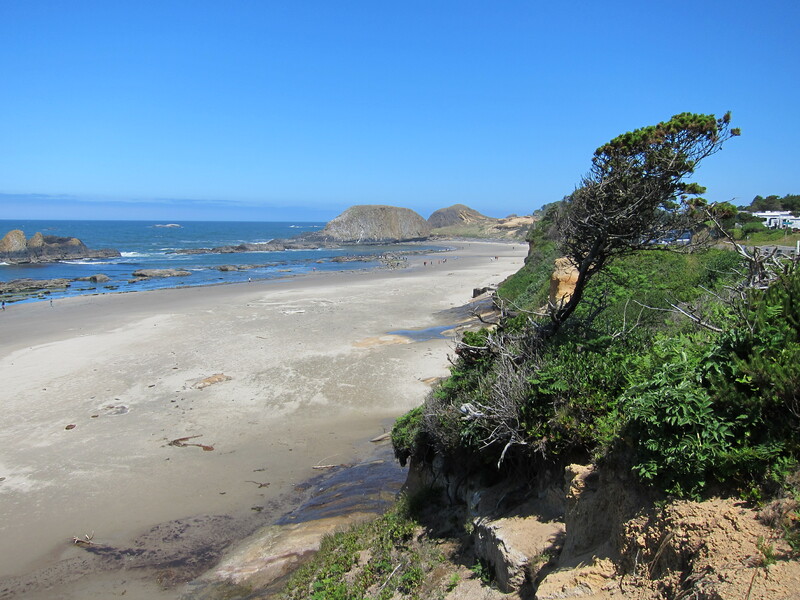 A quick stop in Seal Rock. 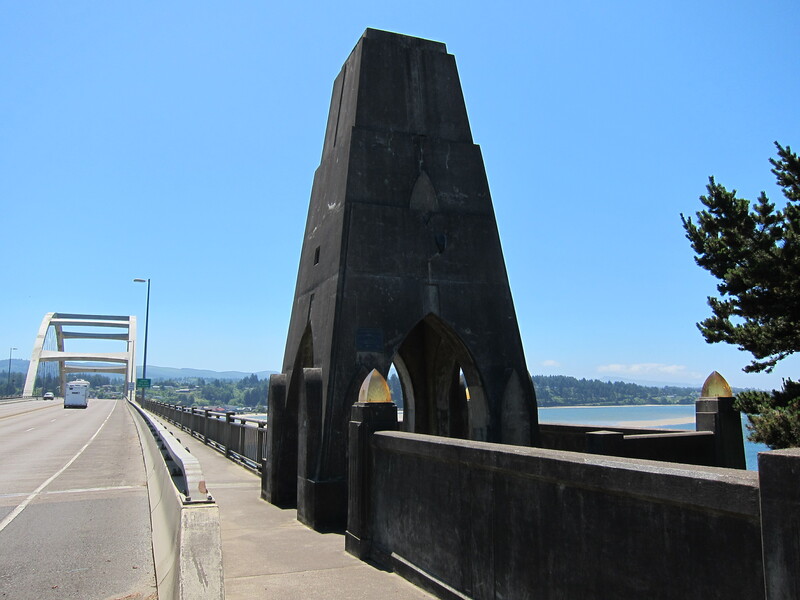 Continued south, crossed the Alsea bay bridge into Waldsport. 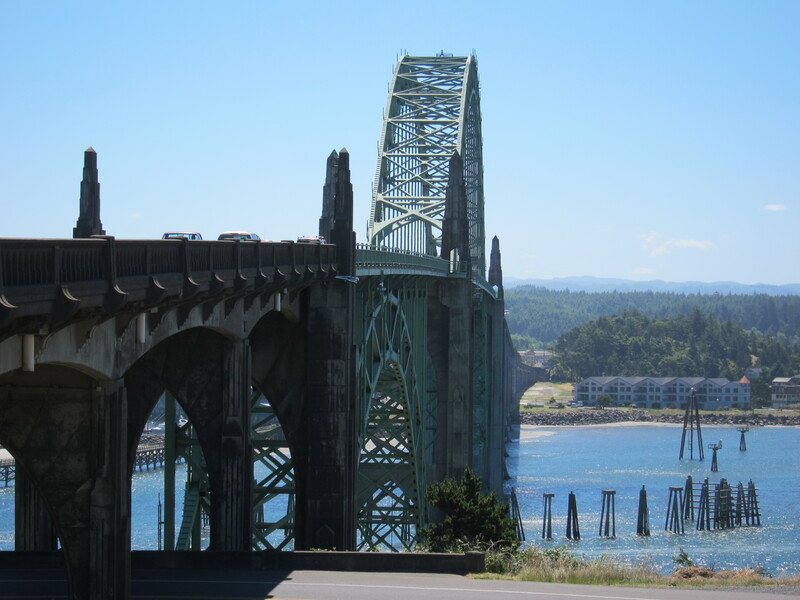 This bridge is not from the same vintage of the others, it is newer, but still has art deco elements to it. 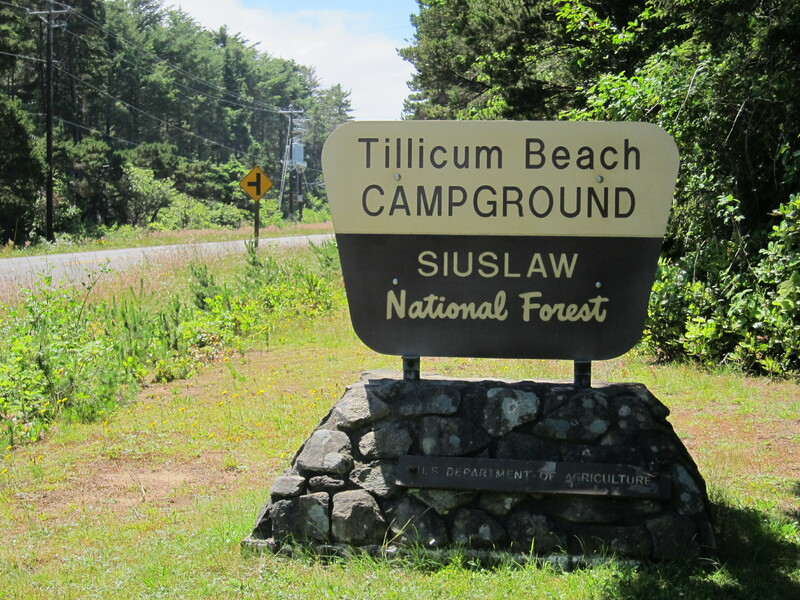 I’ve been wondering about campsites along the Oregon coast. I had heard there is only one by the ocean. 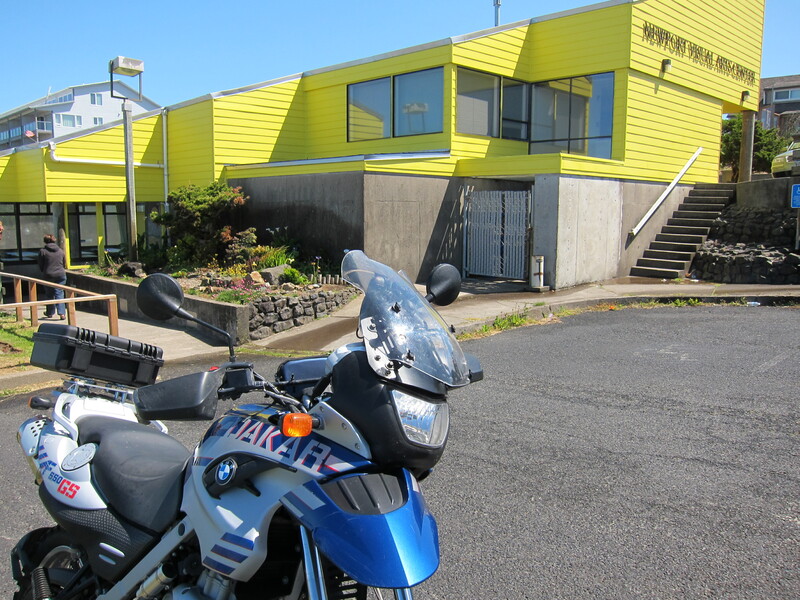 I decided to stop by this one, just north of Yachats and check it out for a possible stopover on a future ride. If there is only one by the beach, than this is it. 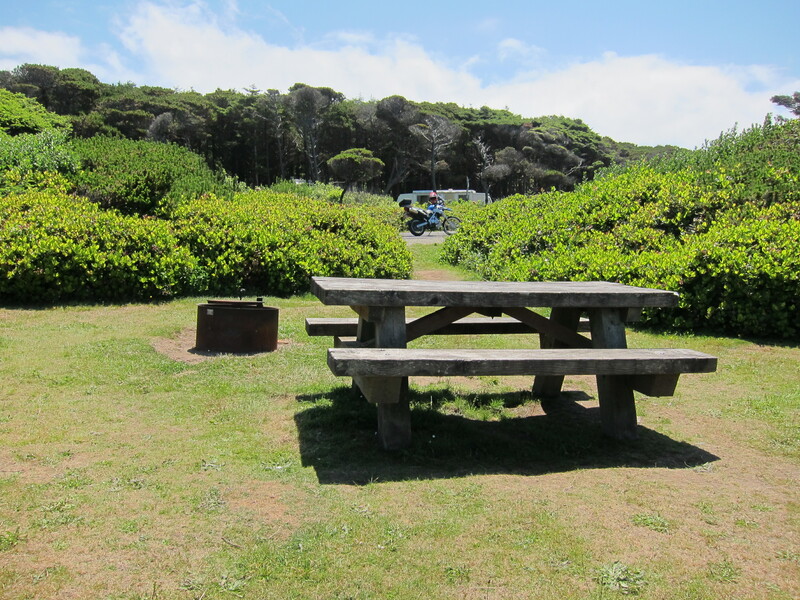 The campsites by the beach are all surrounded by vegetation, making them private, and with their own picnic table and fire pit/grill. A narrow path separates the sites from the parking. And hopefully the ocean sounds will drawn the sound of the motor-home’s generators, which thankfully can not park on a spot on ocean front sites. And here is the view to the beach down below. This camp site has been added to my to do list! 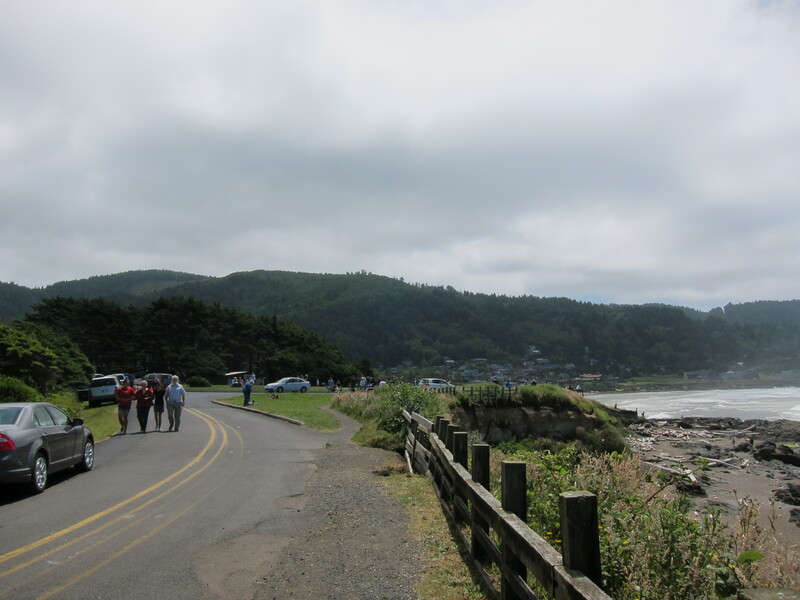 I continued south towards Yachats. 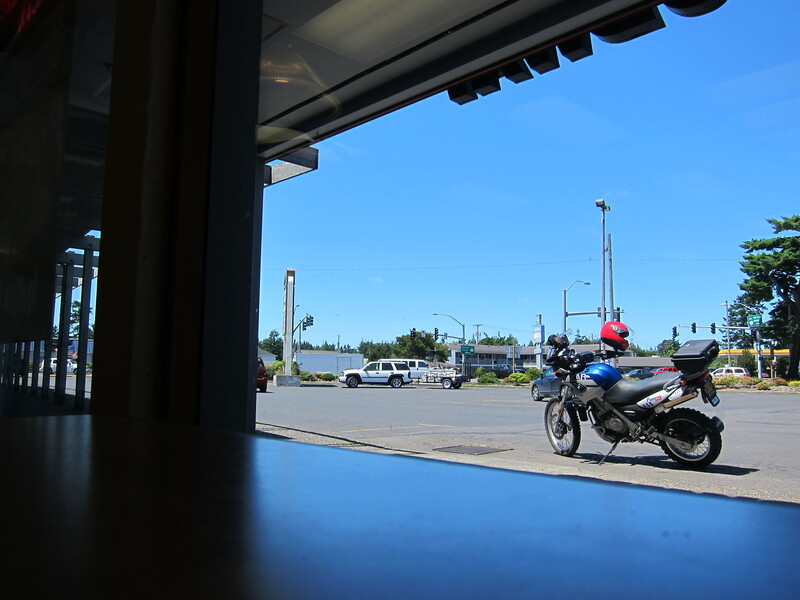 My original plan for this ride was to have lunch in Yachats. By this time I had completely forgotten about July 4th parades. 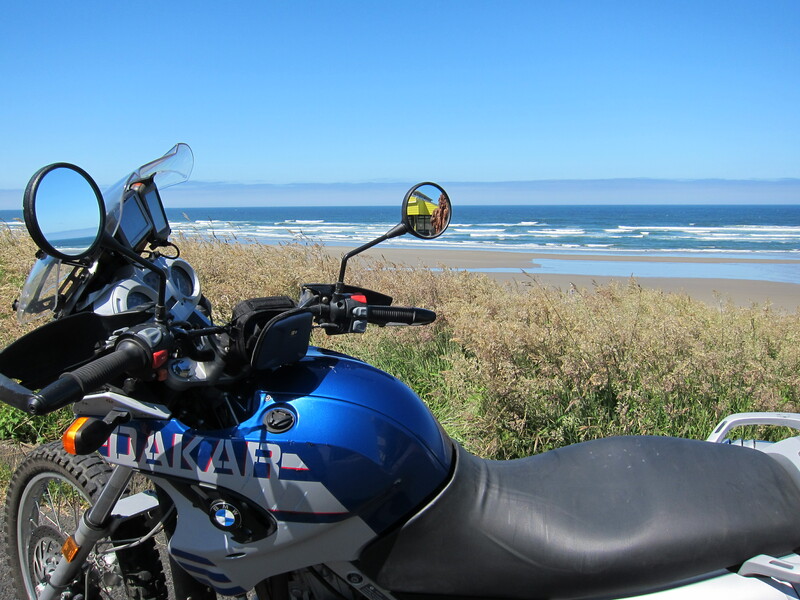 Until I hit traffic less than a mile north of Yachats. It turns out they were having the July 4th parade. I missed it for less than an hour, as I still saw many of the people that had been on attendance walking back to their cars. I could had been the last vehicle on the parade. I certainly had the right colors on the bike and my riding gear. These two were by the road, and they probably turned their chairs to the water after the parade went past them. 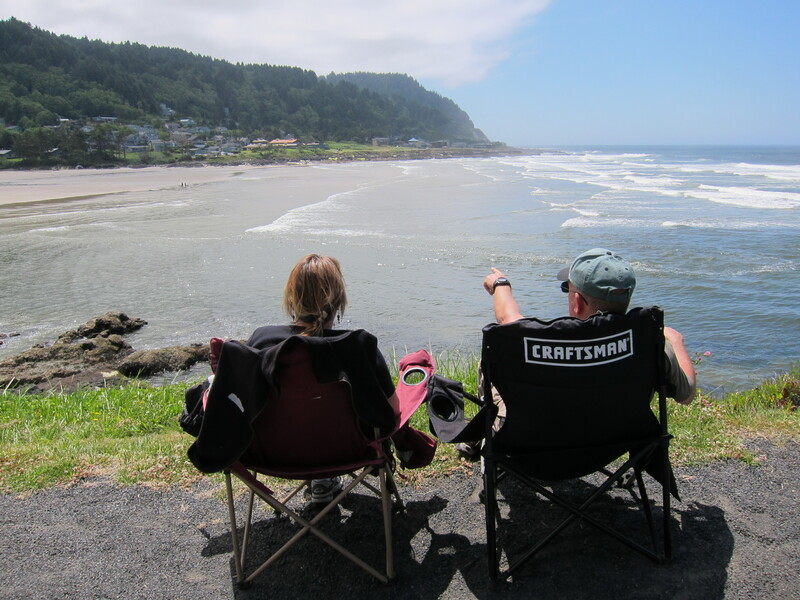 With all the traffic and the crowds, I gave up with the idea for lunch in Yachats and continued south. 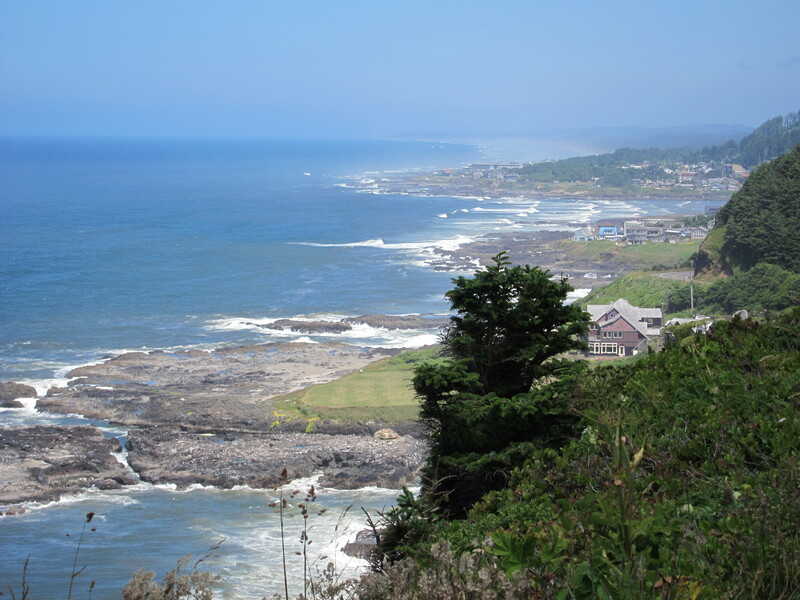 I stopped for this picture of Yachats, taken from a viewing spot about 1 mile south of Yachats. 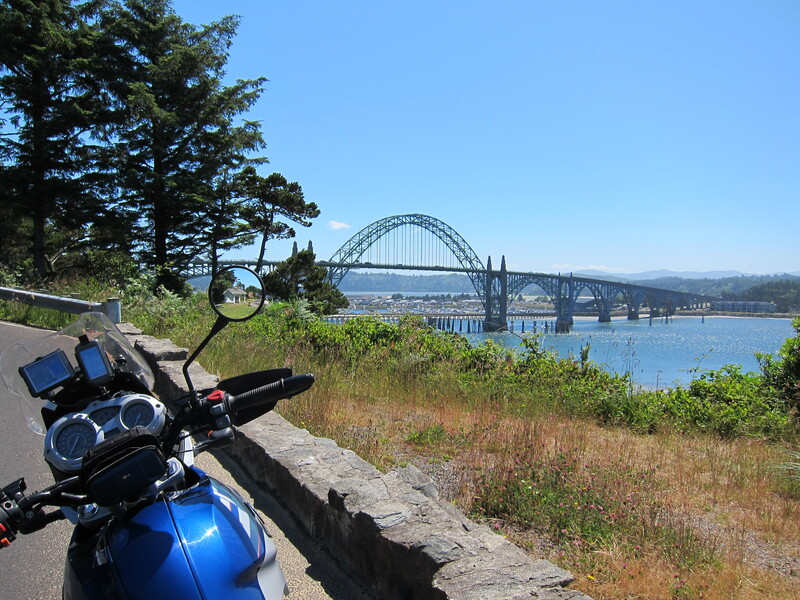 Yes, this area of 101 shows beautiful views of the Oregon coast. 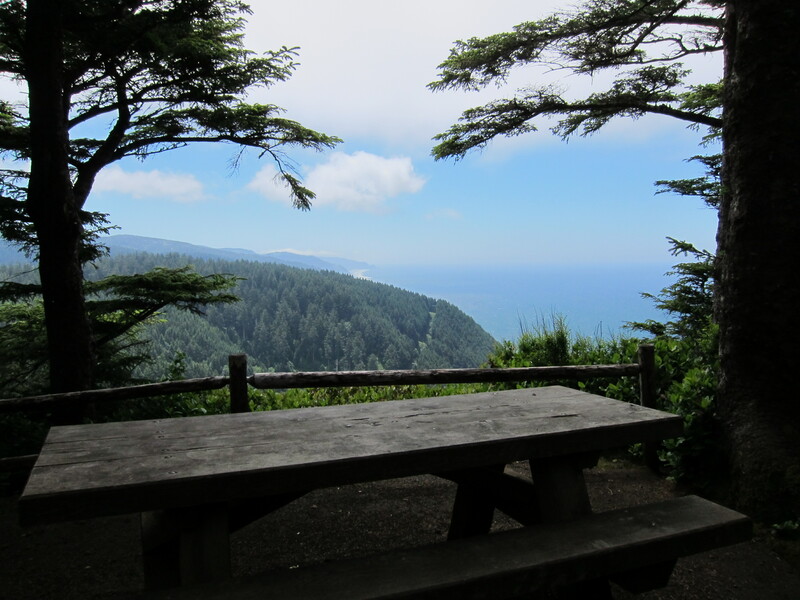 A quick stop in Cape Perpetua, where I went a mile up the hill to the park, and found this view on top. 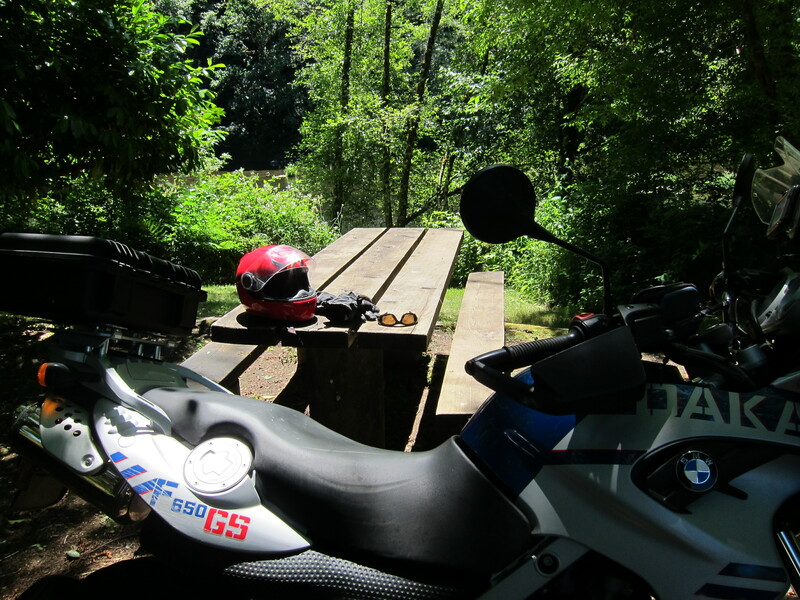 I was hungry… all I could think about now was that this picnic table would be a great place to stop and have lunch. If only I had brought something with me. So I hightailed to Florence. 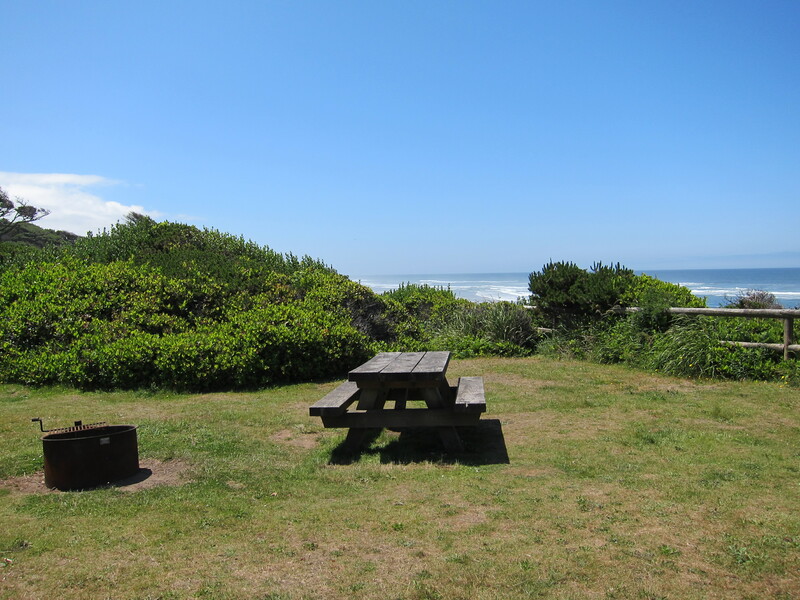 From fancy thoughts of an ocean view meal in Yachats I was content for finding the most convenient and simple place that could serve me a sandwhich right away. Soon I was on the last stretch of this loop, going back home. I took scenic 36 instead of the well traveled 126. 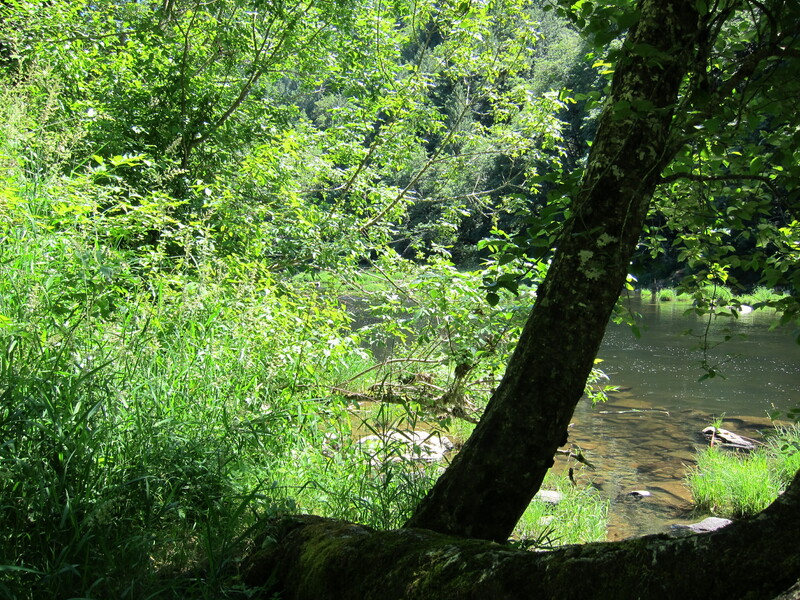 Feeling sleepy, I saw a few picnic tables along the road, by the Siuslaw river. I imagine laying down on one of the benches and taking a nap. Why not? I spotte3d the right one, parked the bike, and took a short nap. In a few minutes I was ready to get going again. 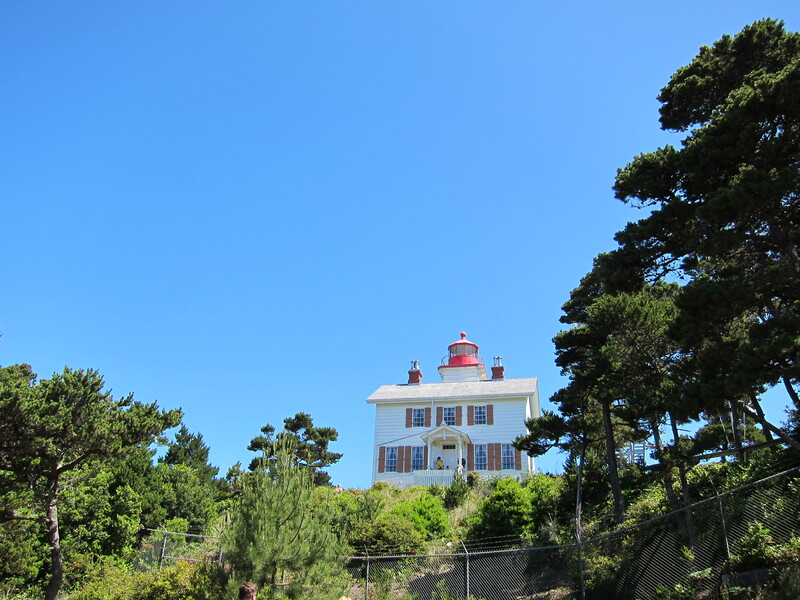 I could feel the temperature had gone up from what it was by the Ocean. A good 10-20 degrees warmer. A quick stop at Triangle Lake for this picture. 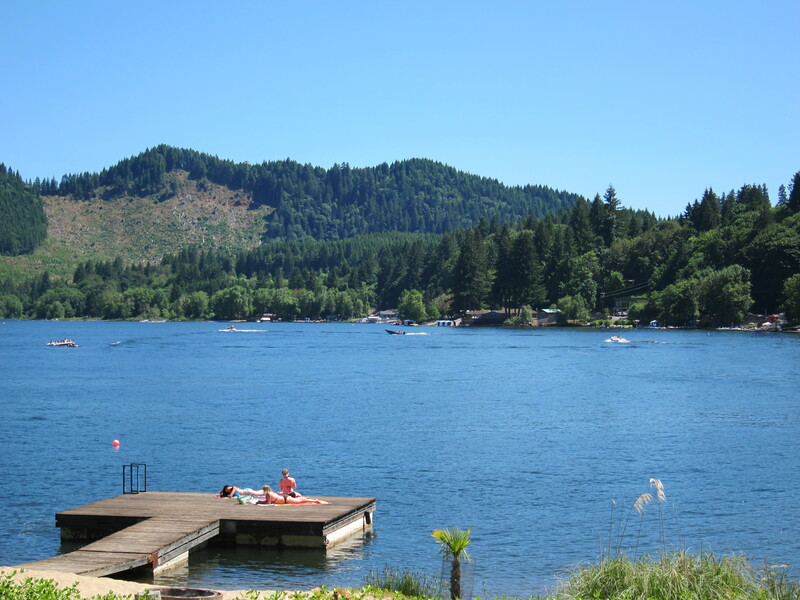 Typical summer weekend on Oregon lakes. And got back home. 228 miles. 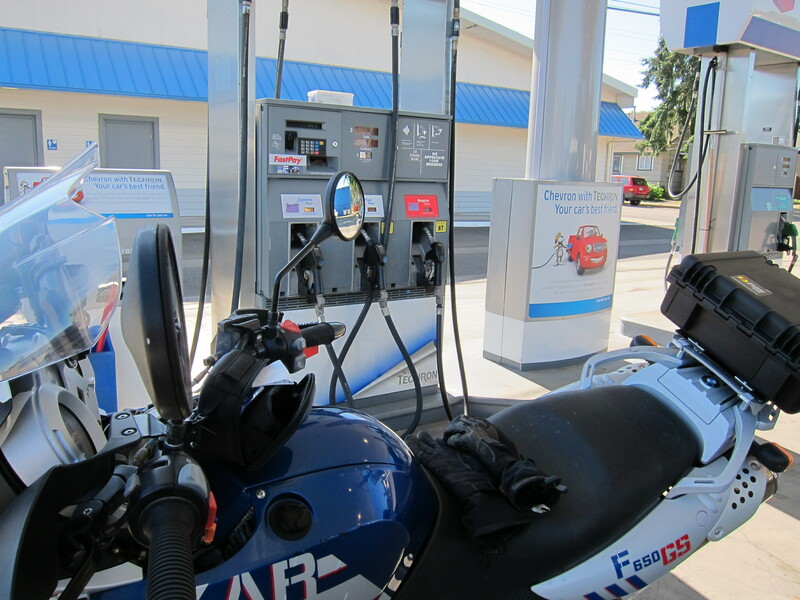 No stops for fuel needed.